Get access to over 200 Awesome pre-made emojis! All New iMessage Effects! *Add Berner Emojis to everything! -Now you can add any of the emojis you build or any of the 200+ Pre-made emojis when taking a photo! -Want to add a Berner emoji to a random picture? No Problem. 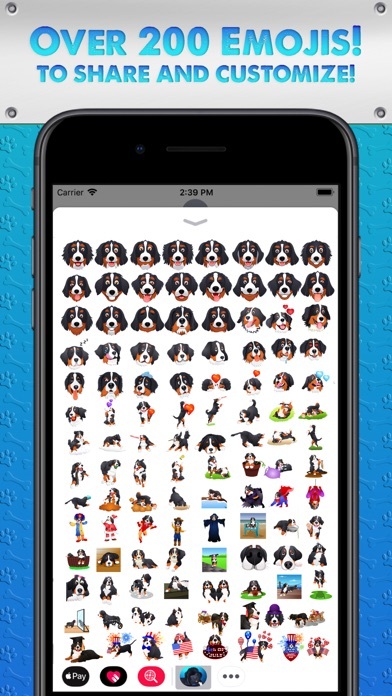 -Want to add a cute emoji face over your Real Berner(s)? No problem. -Want add a Berner Emoji Face to your own head and take a photo or video? Now you can do all of these things with the new Bernermoji 2! Please share with other Berner lovers in your life! Don't forget you can make your own Berner Emojis. Create custom emojis that allow you to add layers like funny accessories like sunglasses, hats, bowties, masks, birthday hats, and much more! Take those emojis and add a background and caption so creating a meme is a breeze! BernerMoji 2 does all that!